The issue of mental illness among people in prisons has been highlighted in several studies. While some raised the problem of its existence and magnitude which varies from 26% in developed countries to 11% in the developing countries, other drew attention either on type of mental illnesses, or to the lack of improvement despite numerous inquiries into the management of mentally disordered people in prison., In any case, mental disorders account for almost 14% of the global burden of disease, and up to 85% of people with severe mental disorders receive no treatment in low- and middle-income countries, compared with 35%–50% in high-income countries. The deprivation of liberty constitutes a significant risk of mental disorder, given the conditions of detention that are not always optimal. Although it is widely acknowledged that most of the detainees have weakened mental health, mental disorders seem to be the most frequent pathologies experienced by prisoners. There is much debate in the literature about the very large numbers of persons with mental illness in jails. Many mental health, law enforcement, and legal professionals are concerned that the criminal justice system in western countries and the judiciary system in whole in developing societies are at the grassroots of the predominant numbers of persons with mental disorders who are in need of not, of treatment., The prevalence data about psychiatric disorders in the course of detention are very wide between countries: 6% in Italy, 13% in France, 29,2% in Zambia, 64% in the United States, and 74% in Australia.,, These high prevalence rates reflect the extent of psychiatric problems in custody compared to the general population, and mirror that it is a serious disturbance that can immediately lead to enormous social, security, and physiological problems, and later to the disruption of the social, economic, and political balance of a nation; a situation which goes against the declared goals of imprisonment, that is “neutralization, punishment, prevention, and cure.” Although a number of studies have not been able to establish factors associated with mental illness in inmate populations, there is a number of contributing factors which can be identified to help explain the high rates of prisoners with mental illnesses. These factors include the limited capacity or none functionality of community-based mental health services to address the needs of mentally ill offenders, deinstitutionalization of mentally ill people, and an increase in the use of drugs and alcohol. In Cameroon, anecdotal evidence from staff working in the correctional system has always suggested a high prevalence of mental illness among the prisoner population. According to this staff, 78 nation's prisons held over 33,000 inmates as of December 2017. The latest methodologically sound estimates of the percentages of persons diagnosed as having a severe mental illness. By using the lower percentages to avoid overstating this phenomenon, Amnesty International estimates that as of December 2016, the number of inmates with mental illness in jails was 30,000. However, it is still unclear how much of the mental disorders are recognized by prison health-care services. With such a large number of this population incarcerated in the criminal justice system as opposed to being treated in the mental health system, it is important to have more detailed information about their psychiatric status, what psychiatric services they used while incarcerated, and eventually what challenges they might present in psychiatric treatment after release. We then conducted this study to explore these issues in detail, specifically to assess the magnitude of mental health in prison, to find out the types of disorders and to identify risk factors associated with the occurrence of those mental illnesses. 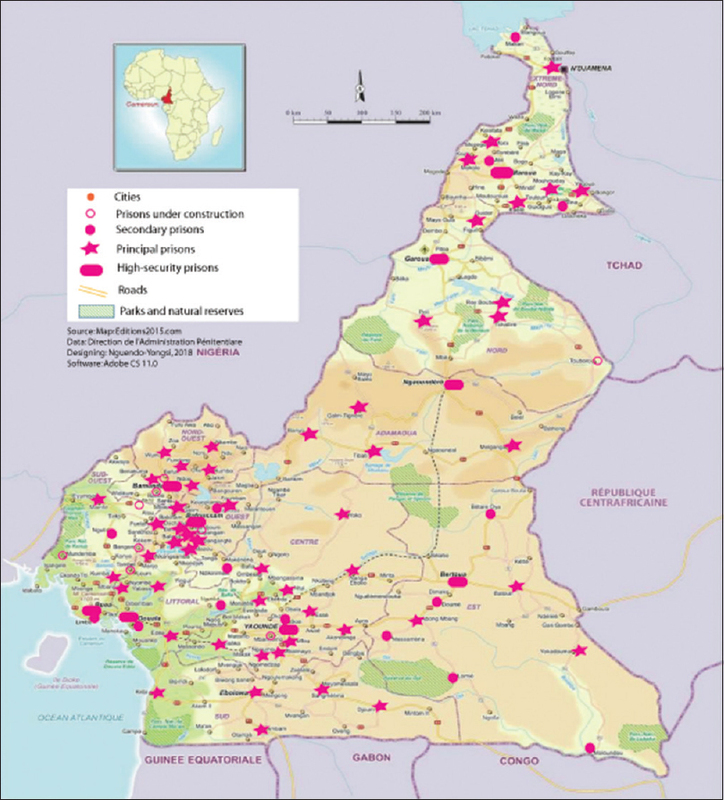 This cross-sectional study was conducted at Kondengui Central Prison, located in Yaoundé between 03°831 N and 11°519 E. Among the 78 functional prisons over the 88 prisons throughout the Cameroonian territory [Figure 1], Kondengui is a maximum security prison in Yaoundé constructed in 1967 to hold only 500 inmates. She is the largest in terms of number of inmates (about 4500 whereas the maximum capacity is 1500 prisoners). It is a mixed prison as she holds both males and females from various statuses (remands, condemned). However, she is made up of 14 yards with two known as “Kosovo yards” hosting nearly 3000 inmates. Although the facility has 16 toilets and 400 beds, she has been the subject of numerous international criticisms for its overcrowding and poor conditions. Participants included remanded, sentenced, and condemned inmates. The sample did not include violent offenders and those requiring maximum security placement because they could not be easily moved into the testing area. In fact, stays in special programming units were generally brief, so that most inmates were unavailable for testing. A sample size of 230 was derived after using the formula: Sample size = z2 × p (1 − p)/m2. Whereby “m” was margin of error that was set at 10%, “z” was confidence level at 95% (1.96) and “p” was postulated prevalence of mental illness. Given the configuration of the premise (14 yards hosting inmates distributed according to the gender and to their social status) and since we were looking for statistical representativeness, participants were selected proportionally, based on the number of inmates in each yard. A sampling frame was constructed by enumerating all the names of the inmates with their corresponding numbers on the register and hosting yard. Using the systematic random sampling technique, a Windows excel function was used to generate a list of random numbers which was used to select inmates from the sampling frame. To diagnose mental disorders, we used the psychometric tool called Mini International Neuropsychiatric Interview (MINI). The MINI is a standard open access psychometric tool used by health professionals to explore the major Axis I of the DSM-IV psychiatric disorders. As well as the self-reported questionnaire developed by the World Health Organization to screen for psychiatric disorders especially in the developing countries, MINI is a structured diagnostic interview made up of questions with modalities to check responses and a space provided for the final diagnosis. The different categories of mental disorders explored were: personality and behavioral disorders (specific personality disorders, mixed disorders, and other personality disorders), mood disorders and affective disorders (manic disorders, depressive episodes, recurrent depressive disorder, and persistent affective disorder), anxiety disorders, (phobic anxiety disorder, other anxiety disorders, obsessive–compulsive disorder (OCD), reactions to a severe stressor and adjustment disorders, delusional disorder, and other neurotic disorders), suicidal risk (mild, moderate, and severe), addiction to alcohol and drugs. The MINI was then administered by ourselves, and MINI diagnoses were characterized by good or very good kappa values. Sensitivity was 0.70 for all disorders except dysthymia and OCD. The instrument assesses suicide risk by combining several relevant items (current or past suicidal thoughts, and attempts), addictions (tobacco, alcohol, and drugs). In addition to this, a structured questionnaire was used to explore demographic features of prisoners, environmental characteristics of the premise, criminal history of inmates, daily financial expenses, reintegration activities, recidivism of detention, overcrowding, respect for the dignity of the person, and existence of other social and emotional factors. Five end-of-year medical students interviewers were trained for phase I (administration of the MINI), and five master students in population studies were trained for phase II (collection of demographic and environmental information). During each phase, interviewers participated in 2-day on-site training in the administration of the questionnaires by a certified MINI instructor. Interviewers practiced with acquaintances and volunteer psychiatric patients. Data processing and analysis were conducted using a Statistical Package for Social Sciences version 18.0 (SPSS 18.0, SPSS Inc, IBM, Chicago, USA). Data were edited using range checks. Associations were established using the uncorrected Chi-square test at the 5% significance level. The Fisher's exact test for association was used to test for the association when a cell in a two by two contingency table had an expected frequency of <5. The magnitude of association was estimated using odds ratio (OR) and its 95% confidence interval to determine associations between sociodemographic factors and mental disorders. The research proposal was approved by the Institutional and Ethics Review Board of the School of Health Sciences of the Central Africa Catholic University. Permission to conduct the study was granted by the General Director of Kondengui Prison. Participation to the study was absolutely voluntary. Participants were informed that they were free to decide whether or not to participate and were also free to withdraw at any time from the study. Both verbal and written consent were obtained from the participants before taking part in the study. Confidentiality was upheld by use of codes on the questionnaires. Given their diminished autonomy and in accordance with the General Director of the setting, participants' interviews were limited to 30 min and were carried out in privacy. Consent forms and questionnaires were only accessible to the investigator. Participants were informed that the decision to participate would not affect their stay in the jail, and a brief quiz was administered to assess competency to consent. A total of 230 participants participated, including 159 (69.1%) male and 71 (30.9%) female. Associated demographic characteristics of the sample are shown in [Table 1]. The mean (standard deviation) age of offenders was 42.1 years, and more than half of the sample was married or was living in a couple (61.7%). There was no great differences. The most frequent charge for which an offender was incarcerated was burglary (36.1%), followed in order of frequency by Public funds embezzlement, sexual abuse, and crimes against persons (11.7%). Most of them were already convicted (66.1%) whereas some were still on pretrial detention (16.1%). Inmates are secured in different wards and mostly in the overcrowded one called “Kosovo” (31.7%), followed by the temporary cell (23.9%). Offenders jailed for embezzlement are secured in the special cell (36.1%) females have their separate ward (30.8%). The occupancy rate per cell is higher as we recorded at least between 10 and 50 inmates per cell. The majority does not have access to facilities such as water for the shower and improved toilets, as well as to any assistance [Table 2]. Out of the 230 participants, 80 met the criteria for at least one-lifetime disorder when assessed with the MINI, that is, a prevalence rate of 34.78%. 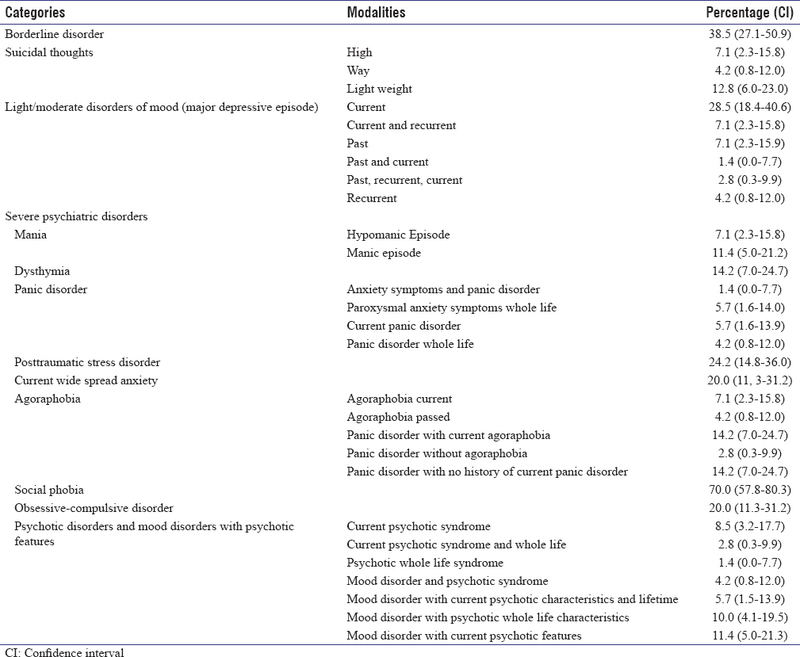 In examining the prevalence of current disorders [Table 3], severe psychiatric disorders are the most common, whereas suicidal thoughts and the borderline personality disorders are the less common. Factors associated to those mental illnesses include penal status, cell occupancy rate, repeat offences, and use of psychoactive substances among others. Thus, the fact of “having already been incarcerated twice or more,” is statistically associated with the risk of developing a mental disorder. For example, 36.96% of inmates with severe psychotic disorder were incarcerated more than once (OR = 3.83, Sig = 0.03). Environmental factors also affect the health of prisoners. The study shows that cohabitation and social cohesion actions reduce by almost 75% the risk of developing mood disorders (OR = 0.24) compared to those incarcerated in isolation (special cell). Respect of privacy and having access to sanitary facilities reduce the risk of developing a mood disorder by 65%–80% and the risk of developing a suicidal risk by 96% and (OR = 0.22). People with no socioeconomic occupation within the prison are twice as likely to have a personality disorder (OR = 2.85). With regard to sociological factors, it appears that family ties and the frequency of family assistance reduce by 76% the risk of developing mood disorders and personality disorders (OR = 0.23; Sig = 0.01). However, with no family assistance, the risk of developing borderline personality disorders increases thrice (OR = 3.43%). Vulnerability to mental disorders also comes from psychological characteristic and addiction to drugs. For example, living in fear increases the risk of developing severe psychotic disorders by four times and more (OR = 4.37, Sig = 0.00). In 45% of cases, the use of drugs increases the risk of developing a personality disorder by more than three times (OR = 3.21). The prevalence rate of mental disorders in this study was 34.78%. This prevalence rate is lower than 56% obtained in the state maximum security prisons in the USA, or than 63.1% and64% obtained in the medium security prison respectively in Zambia and Australia., However, these findings are synonymous to those by Loeb et al. that show a pattern of lower prevalence rate prisons. 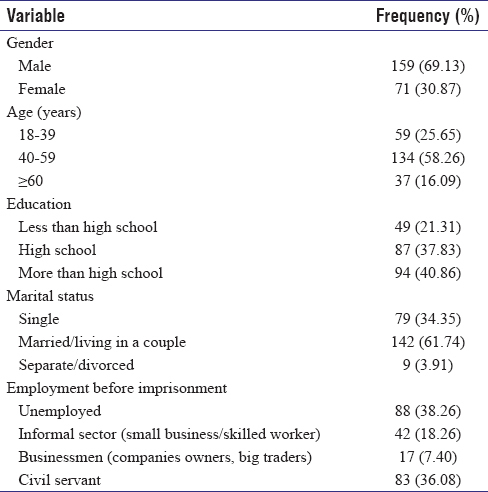 The study confirms the high frequency of mental disorders in incarcerated offenders, findings generally consistent with reports from other prison-based studies., Within the Cameroonian context, this prevalence rate seems to be increasing and is in accordance with the increase trend in all the prisons throughout the country [Figure 2]. As seen, several inmates met criteria for at least one lifetime MINI disorder. Compared with community rates, severe psychotic disorders, mood and anxiety disorders, borderline personality disorders, and suicidal thoughts were all more frequent as reported by Diamond et al. The high frequency of mental disorders is fairly dependent of gender, type of offense, education level, and age. Females' inmates were less likely to have mental illness compared to males. This situation may be explained by the fact that, women are given a preferential treatment as, for example, they are secured in separate cells of not more than 100 inmates. However, our expectations regarding the distribution of disorders were not confirmed, because male inmates in this study, according to focus group discussions held, had a number of social amenities such as sports, religious activities as well as communication facilities which were contributing positively to their mental well-being. Of importance, the study shows that current disorders are common among persons newly committed. The distinction between current and lifetime disorders has generally been ignored or omitted in prior prevalence studies. While it is necessary to understand lifetime rates, data for the current disorders are more important in terms of planning because these are conditions that may require urgent attention. The presence of these disorders suggests that women may need special programs to address their needs. For example, women may have more difficulty adjusting to their conviction and incarceration than men and may benefit from counseling that addresses this transition. Because psychotic features are commonly observed in people constantly down in dungeon, a high rate of OCD is not surprising [Table 4]. Another possible explanation of these high prevalence figures is that the MINI over diagnoses psychotic disorders. Leon et al. (1997) and Sheehan et al., each reported a relatively high rate of false-positive diagnoses of psychotic disorders with the MINI. Nor has the MINI been standardized in the setting of criminal prosecution and incarceration, unusual experiences that could contribute to elevations in instruments designed to measure strange experiences. The permanent stress here can also be attributed to the disruption of the life social rhythms in an environment different from the house since in prison inmates are by regulation obliged to live together, which implies confrontation with postural, gestural, corporal styles, physiological rhythms, and different lifestyle habits. In addition to confinement, there is continual encroachment of privacy under the combined effect of promiscuity and close watch of co-inmates. While examining our results, it appears that lack of intimacy in prison is associated with mood disorder (60.4%, P = 0.02). Two kinds of temporality external to the prison affect the mental health of prisoners at Kondengui: The judicial temporality in a relationship with the procedure rhythm and the length of the sentence. From our study, inmates convicted for property offenses were 12 times (12.5%) more exposed to dysthymia disorders than those convicted for personal injury (P = 0.02). Moreover, inmates sentenced <12 months' detention (52.8%) were at greater risk than those who already completed more than 12 months' imprisonment (P = 0.03. Looking beyond the temporal sequence which runs from the cells closing till the sunrise, there is a long period of confinement, and for prison warders, it does not matter whether inmates are claustrophobic or not. Sleeping all the time, the brain never completely sleeps, lack of privacy during the night, common showers, toilets/restrooms installed at the center of the cell, of course intensify anxiety and generate stress. In short and according to Maschi et al., various protective barriers which filter and regulate relations with others are cracked to the last bulwark that constitutes the body envelope. The rate of suicide thoughts (34.29%) mostly among inmates aged 40 years and more should also raise concerns. The disorder has gained increasing attention, as it has become clear that it is common and widespread in the general population, yet few prison-based studies have been conducted to investigate this concern. Our results differ from those of Ferriera et al. where the youngest adults appear to be the most vulnerable. Nevertheless, various studies conducted in the USA do not necessarily agree on the effect of age, meaning that age is not clearly recognized as a risk factor., However, length of imprisonment has appeared to be correlated to suicide risk in prison: More than half of the prisoners with sentence <5 years were likely to commit suicide. This situation can be explained by the fact that suicidal thoughts are based on several situations: Death by suicide in the neighboring cell, death of a close inmate, personal desire to die rather than to be deprived of liberty or to be tortured permanently by prison guards, as it is revealed by an ex-convict who share the indignity and mental torture and inhuman condition of inmates: We were treated like common criminals. “I witnessed young men beaten and degraded beyond any human imagination. Passing one through the balançoire and beating of the soles of the feet were common features for the treatment meted out to the detainees.” According to this category of inmates, prison is a “little death, a slow death,” and rather to that, it is preferable to die fast by committing suicide. The fact that the disorder leads to death should lead to discussions regarding the merits and emergency of providing appropriate care/counseling in correctional settings. The prison environment is particularly favorable to mental disorders. At Kondengui Correctional Prison, we found a diversity of mental disorders including borderline personality disorders, mood disorders, suicidal risk, and severe psychotic disorders. For most inmates with severe psychiatric disorders, their prevalence is higher in the overcrowded wards, which host formerly social and economic disadvantaged convicted inmates. Risk factors associated with mental disorders are environmental, sociological, and individual. They include lack of privacy, amenities insufficiency, overcrowding, lack of family assistance and social support, and inadequacies in the social reintegration system. These findings should raise concerns about the adequacy of the current screening programs for mental disorders in state prisons and the response of correctional personnel in providing adequate treatment services. Both screening and treatment are legally mandated yet in consistently implemented throughout the 78 state prisons. Due to the large burden created by mental disorders, it is urgent that correctional facilities face the growing challenges of providing treatment services to incarcerated offenders. While the MINI proved to be useful in this study, its length, complexity, and requirement for interviewer training suggest that it is not appropriate as a screening tool in prisons. Its developers have devised a quick screener for use in primary care estimated to take 5 min to administer that should be studied for its utility in the correctional system. There are several limitations to this study. First, the study was relatively small, and the power may be insufficient to detect significant differences between the men and women. Second, because the study was exploratory, we chose not to correct for the number of comparisons made. Third, data or this study is limited to the self-report of the offender and available public information from the IDOC. The diagnoses are based on the MINI, and no medical records or laboratory data were available. Finally, while it appeared that participants were forthright in self-reporting symptoms of mental illness, some degree of underreporting of antisocial behaviors and over-reporting of symptoms of mental illness is possible. Galanek JD. The cultural construction of mental illness in prison: A perfect storm of pathology. Cult Med Psychiatry 2013;37:195-225. Fazel S, Hayes AJ, Bartellas K, Clerici M, Trestman R. Mental health of prisoners: Prevalence, adverse outcomes, and interventions. Lancet Psychiatry 2016;3:871-81. James DJ, Glaze LE. Mental health problems of prison and jail inmates. Bureau of Justice Statistics. Washington: US Department of Justice; 2006. p. 178. Ogloff JR, Davis MR, Rivers G, Ross S. Criminology Research Council Consultancy: The Identification of Mental Disorders in the Criminal Justice System. Melbourne: University Press; 2006. Gunter TD, Arndt S, Wenman G, Allen J, Loveless P, Sieleni B, et al. Frequency of mental and addictive disorders among 320 men and women entering the Iowa prison system: Use of the MINI-plus. J Am Acad Psychiatry Law 2008;36:27-34. Diamond PM, Wang EW, Holzer CE, Thomas C, Cruser dA. The prevalence of mental illness in prison. Admin Policy Ment Health 2001;29:21-40.
WHO. Health in Prisons: A WHO Guide to the Essentials in Prison Health. Denmark: WHO Regional Office for Europe; 2007. p. 198. Bahena S, Cooc N, Currie-Rubin R, Kuttner P, Ng M. Disrupting the School-to-Prison Pipeline. Harvard Education Press; 2012. p. 288. Stefen RS. Grassroots challenges to the effects of prison sprawl on mental health services for incarcerated people. Fordham Urban Law J 2018;45:437-97. Mweene MT, Siziya S. Prevalence of mental illness among inmates at Mukobeko maximum security prison in Zambia: A crosssectional study. J Ment Health Hum Behav 2016;21:1057. Butler T, Allnutt S. Mental Illness among New South Wales' Prisoners. Australia: NSW Corrections Health Service; 2003. p. 198. Caplow T, Simon J. Understanding prison policy and population trends. Crime Justice 1999;26:63-120. Stephen G. Legal Empowerment: Practitioners' Perspectives. International Development Law Organization; 2010. p. 309. Maschi T, Aday RR. The social determinants of health and justice and the aging in prison crisis: A call for human rights action. Int J Soc Work 2014;1:15-32. Division of Penitentiary Administration. Facts about penitentiary administration. Paris: Ministry of Justice; 2012. p. 16. Available from: http://www.justice.gouv.fr/art_pix/Chiffres_cles_2012.pdf. [Last accessed on 2016 Jul 27]. World Health Organization. User's Guide to the Self Reporting Questionnaire (SRQ). Copenhagen: WHO Publication; 2004. Sheehan DV, Lecrubier Y, Sheehan KH, Amorim P, Janavs J, Weiller E, Dunbar GC. The Mini-International Neuropsychiatric Interview (M.I.N.I. ): The development and validation of a structured diagnostic psychiatric interview for DSM-IV and ICD-10. J Clin Psychiatry 2004;20:34-57. Nseluke MT, Siziya S. Prevalence and sociodemographic correlates for mental illness among inmates at Lusaka Central Prison, Zambia. Med J Zambia 2011;38:37. Baldry E. Prisons and vulnerable persons: Institutions and patriarchy. In: Segrave M, editor. Australia & New Zealand Critical Criminology Conference 2009: Conference Proceedings, Criminology School of Political and Social Inquiry, Faculty of Arts, Monash University; 2009. p. 305. Loeb SJ, Steffensmeier D, Lawrence F. Comparing incarcerated and community-dwelling older men's health. West J Nurs Res 2008;30:234-49. Maschi T, Kwak J, Ko E, Morrissey MB. Forget me not: Dementia in prison. Gerontologist 2012;52:441-51. Fazel S, Danesh J. 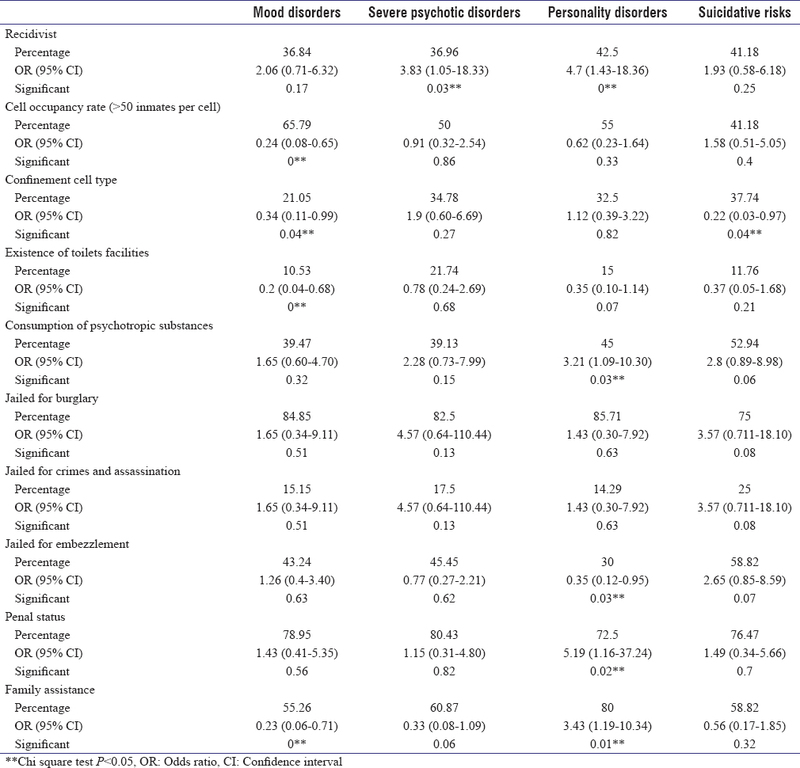 Serious mental disorder in 23000 prisoners: A systematic review of 62 surveys. Lancet 2002;359:545-50. Diamond PM, Wang EW, Holzer CE 3rd, Thomas C, des Anges Cruser. The prevalence of mental illness in prison. Adm Policy Ment Health 2001;29:21-40. McKenna B, Skipworth J, Tapsell R, Madell D, Pillai K, Simpson A, et al. A prison mental health in-reach model informed by assertive community treatment principles: Evaluation of its impact on planning during the pre-release period, community mental health service engagement and reoffending. Crim Behav Ment Health 2015;25:429-39. Senior J, Birmingham L, Harty MA, Hassan L, Hayes AJ, Kendall K, et al. Identification and management of prisoners with severe psychiatric illness by specialist mental health services. Psychol Med 2013;43:1511-20. Butler T, Andrews G, Allnutt S, Sakashita C, Smith NE, Basson J, et al. Mental disorders in Australian prisoners: A comparison with a community sample. Aust N Z J Psychiatry 2006;40:272-6. Moki EK. Rights Groups Decry Decrepit Conditions in Cameroon Prisons. Available from: https://www.voanews.com/a/rights-groups-decry-decrepit-conditions-in-cameroon-prisons/3176438.html. [Last accessed on 2017 Nov 17]. Teyou B. Penguin Archipelago: The Story of French Hostages whom Sarkozy Refused to Set Free. Paris: Nation Libre; 2012. p. 192. Por Fonchingong RC. Stifled Justice in Cameroon: Detained for Six Years without Judgement. Laanga research and Publishing Common Initiative Group, Mankon, Bamenda, 2016, 230 p.
Philip MJ, Brinded SI, Mulder RT, Fairley N, Malcolm F, Wells EJ. The Christchurch prisons psychiatric epidemiology study: Methodology and prevalence rates for psychiatric disorders. Crim Behav Ment Health 1999;9:129-95. Leon AC, Olfson M, Portera L, Farber L, Sheehan DV. Assessing psychiatric impairment in primary care with the Sheehan disability scale. Int J Psychiatry Med 1997;27:93-105. Esposito M. The health of Italian prison inmates today: A critical approach. J Correct Health Care 2010;16:230-8. Nguendo Yongsi HB. Knowledge and social distance towards mental disorders in an inner-city population: Case of university students in Cameroon. Trends Med Res 2015;10:87-96. Boh H, Ofege N. Prison Graduate: The Story of Cameroon Calling. Yaoundé: United News Service; 1991. Binswanger IA, Merrill JO, Krueger PM, White MC, Booth RE, Elmore JG, et al. Gender differences in chronic medical, psychiatric, and substance-dependence disorders among jail inmates. Am J Public Health 2010;100:476-82. Maschi T, Gibson S, Zgoba KM, Morgen K. Trauma and life event stressors among young and older adult prisoners. J Correct Health Care 2011;17:160-72. Ferreira MH, Colombo ES, Guimarães PS, Soeiro RE, Dalgalarrondo P, Botega NJ. Suicide risk among inpatients at a university general hospital. Rev Bras Psiquiatr 2007;29:51-4. Fazel S, Seewald K. Severe mental illness in 33,588 prisoners worldwide: Systematic review and meta-regression analysis. Br J Psychiatry 2012;200:364-73. Way BB, Miraglia R, Sawyer DA, Beer R, Eddy J. Factors related to suicide in New York state prisons. Int J Law Psychiatry 2005;28:207-21. Wakai N, Wakai C. Inside the Fence: Reminiscences as a Detainee. Bamenda, Cameroon: Patron Pub. House; 2000.